Our ballerina design is simply stunning and is perfect for the baby or little girl that is going to grow up to be a ballerina. We have create yet another layered design. The background is a beautiful, elegant floral pattern that we have done purple/lavender tone on tone color. Our second background is a subtle radial fill to highlight our beautiful ballerina. In the foreground, we have our beautiful vintage ballerina. For personalization, we added her name in a simple upright script font. 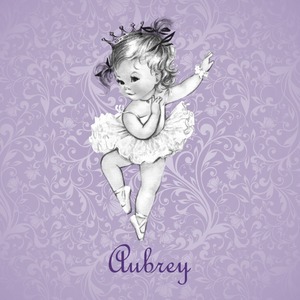 This design is suitable for baby and kids, however, we have other ballerinas in our system i.e. teen & adult ballerinas - so the design could very easily be converted by changing out the graphic to one of the older ballerinas.